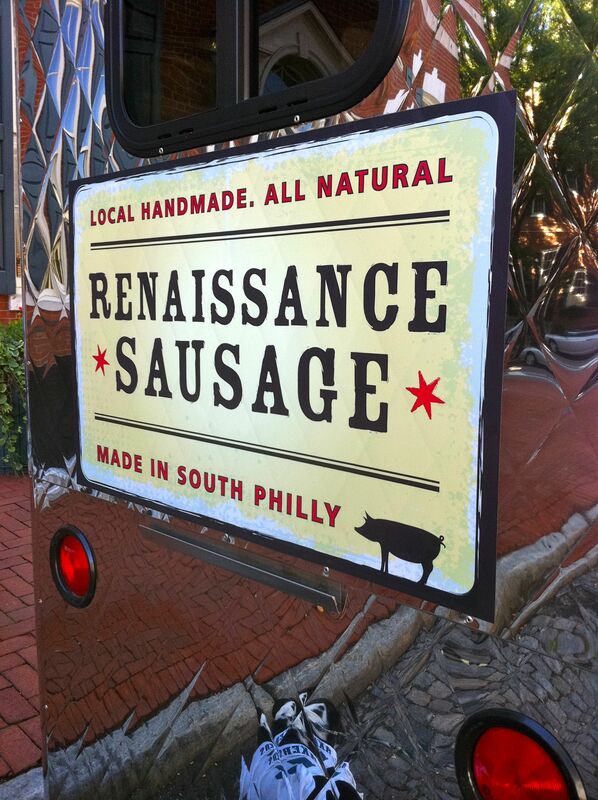 Any reader of this little blog knows how much I adore the Renaissance Sausage Truck and just how heartbroken I was when they shut down. 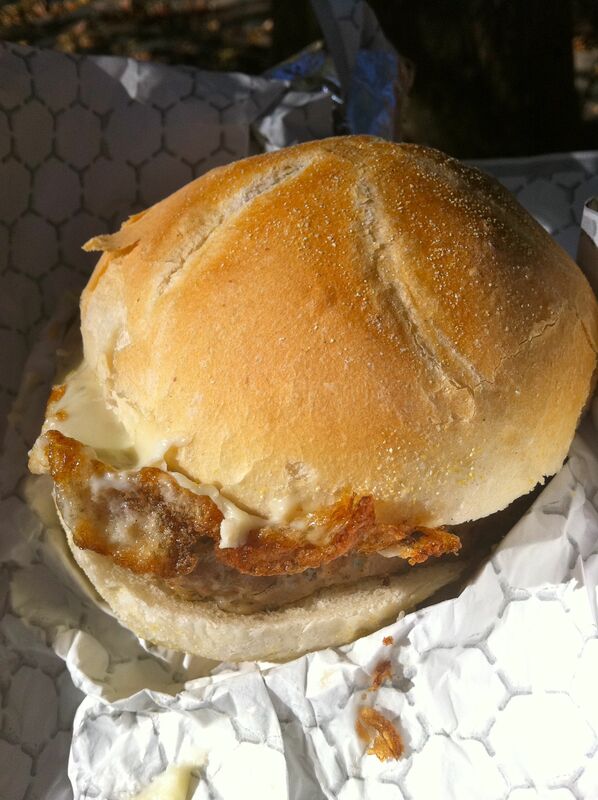 For me, every Sunday between May and December meant a sausage sandwich from their truck at the Headhouse Square Farmers Market. I often opted for the hearty vegetarian sausage with caramelized onions and a vegan chipotle mayo. Ever since they closed, our Sundays haven’t quite been the same. Recently, I heard news that the Sausage Truck was re-imaging itself as a Sausage “cart.” Cart, truck, makes no difference to me. I couldn’t wait to wrap my mouth around one of those tasty sausages again. When we first approached the cart, everything looked kind of like a mini-me of the original truck. I love the “Made in South Philly” logo. I scoped the good-looking menu, albeit smaller due to obvious space constraints. I had actually eaten the breakfast sandwich once before and it was probably the best breakfast sandwich I’ve ever eaten. I obviously ordered that again. Pork sausage, organic egg and local american cheese. Can’t quite beat that. Luckily, the breakfast sandwiches come pre-made and I was able to eat immediately. 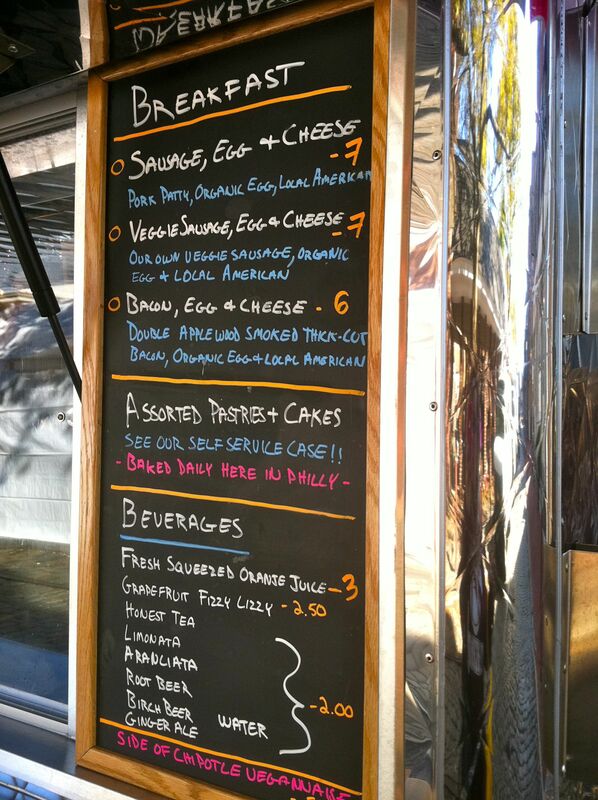 I don’t love a breakfast sandwich that’s heavy on the egg and these folks got it just right. Rather than using it as an add-on, the focal point of the sandwich is actually the meat. How can you possibly beat that? While I’m sure my father will be aghast, this porky sausage is inimitable. The sage and thyme flavor mingle perfectly with the tiniest bit of a spicy kick. Bottom line: eat this sandwich now. 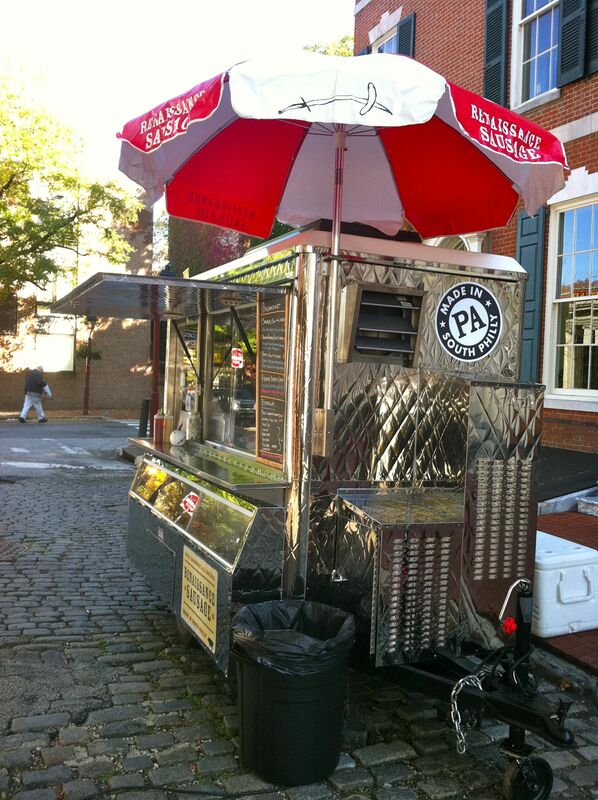 I cannot tell you how sad I was when the sausage truck went away from Headhouse for a few weeks. BUT imagine my delight when it came back, with even better breakfast sandwiches! They are amazing, and that veggie sausage is out. of. this. world. Love your site– thanks for the review!